Webb attended the sixth annual PinkNews Awards on Wednesday night (October 17) at Church House, Westminster, London. Webb was then asked whether he and Butland-Steed are on good terms at the moment. Webb originally found fame on Gogglebox by appearing with Butland-Steed, who was his boyfriend at the time. The two remained friends after they broke up. Butland-Steed left the show after ten series in February this year, saying he wanted a “new start.” Webb has since been joined on the show by mum, Pat. In July, Webb married his partner Daniel Lustig at a wedding in France. The couple tied the knot at Chateau de Lisse in Lot-et-Garonne, and spent their honeymoon in the South of France. Butland-Steed, meanwhile, married his partner, landscape gardener Tony Butland, at Brighton’s famous The Grand Hotel in 2017. The pair got engaged at the top of the Eiffel Tower in 2015. Webb appeared on stage at the PinkNews Awards along with Shadow Foreign Secretary Emily Thornberry to present the Broadcast Award, which this year was jointly awarded to the podcasts Homo Sapiens by Will Young and Chris Sweeney and Reasons to be Cheerful by Ed Miliband and Geoff Lloyd. 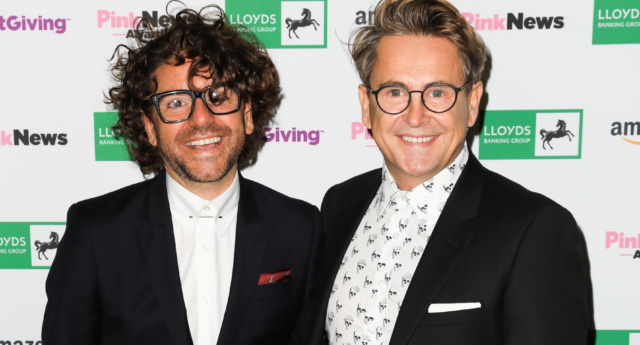 The founders of Stonewall were honoured with PinkNew’s Lifetime Achievement Award at Wednesday night’s ceremony, which was presented by former Prime Minister Tony Blair. Other winners on the night included the BBC’s A Very English Scandal in the Drama Award category; the Royal Navy and Royal Marines for the Public Sector Equality gong; and Lord Hayward and Conor McGinn MP jointly won Politician of the Year.